Professor Rodney Paul with students in the Milton Conrad Sport Technology Lab. Assembling a championship-caliber team and a profitable business organization is a challenge that sports owners, executives and managers face every day in the ultra-competitive world of sports. Increasingly, they are turning to data analytics for an advantage. Whether it is predicting player performance, athlete injury recovery or enhancing an organization’s bottom line, analytics is changing the methodology of how teams, leagues and sport managers are competing to make better, quantifiable decisions. Sport analytics is a growing segment of the industry, where many young, aspiring sport professionals are choosing to make a career. They’re data-driven—and they’re catching the eye of sports teams all over the world. Evan Weiss, a senior sport analytics student in the Falk College, was hired as a junior to work with the Buffalo Bills during the Fall 2018 semester. He returned to campus in January to complete his degree and will continue working for the Bills after graduation in May. Fellow senior Justin Perline has accepted a full-time analytics position with the Pittsburgh Pirates after interning with the team in summer 2018. Weiss and Perline are some of the University’s first sport analytics majors. In fall 2016, the program welcomed its first official class as the first undergraduate degree of its kind in the nation. The intensive program with coursework in economics, mathematics and computer programming has attracted competitive students from around the world. The degree includes a foreign language requirement to prepare students for the international sport industry. Sport analytics students can choose to study abroad in places like Florence, Strasbourg, London and others through Syracuse Abroad. Other global hands-on experiences are also available to students. In August 2018, Perline presented at a conference in London with senior C.B. Garrett on “Minor League Team Success and Its Impact on MLB Player Performance.” Then Perline spent part of winter break in the Dominican Republic scouting for the Pittsburgh Pirates. Meanwhile, back in Syracuse, fellow classmates Dylan Blechner, Zak Koeppel, Will Friedeman and Cameron Johnson were diligently working on a project for the NFL’s inaugural Big Data Bowl competition. The competition provided participants with access to NFL player-tracking data to create proposals on one of three topics: player speed, game rules and receiver routes. Their entry, “Route Clustering,” placed in the top nine from more than 100 submissions and was one of five entries to receive an honorable mention. Research, competitions and presentations as individuals and teams are a regular part of student work outside of the classroom, in addition to the required senior thesis. “Celebrity Attraction in the Minors: The Case of Tim Tebow,” a paper by seniors Cody Barbuto, C.B. Garrett and Kyle Liotta, was published by the Journal of Economics and Finance in January 2019. Barbuto presented another paper, “GINI Coefficients in the NBA,” at the Academy of Economics and Finance conference in Tampa, Florida, in February. Barbuto’s classmate, junior Nick Riccardi, won the student paper competition with his study, “Canadian Hockey League Game-To-Game Performance.” Riccardi also presented his study at the ACC Meeting of the Minds conference at the University of Louisville in March. 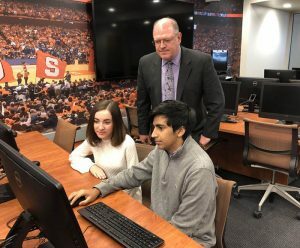 Syracuse sport analytics students have wasted no time in putting the University’s young sport analytics degree program on the map. Another milestone in the rapid and successful start to the new program will take place April 3 in Chicago at the inaugural Andrew T. Berlin Sport Analytics Symposium, hosted by the Falk College’s Department of Sport Management.